Friends! How I’ve missed your shining faces! But here I am, back again for my monthly blog post. Really, I have dozens and dozens of pictures of food just waiting for me to paste them into a blog post, if only I could drag myself from the delights of Netflix Instant (namely the classics, i.e. Look Who’s Talking and Ren and Stimpy). 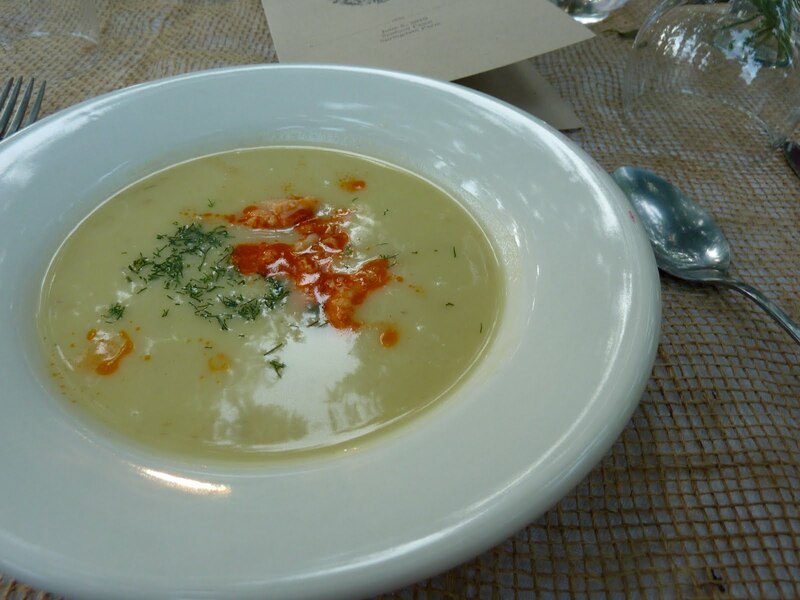 This is a Chilled Potato, Leek and Crawfish Soup. Oooh, it was tasty! It was so hot outside, and this cold soup was a refreshing kickoff to the meal. It was light and creamy, with perfectly cooked crawfish and a flash of dill. Also, please note the adorable burlap table cloth. It was a very charming table (or tablescape as Sandra Lee would say). I might as well tell you now- the rest of the courses were served family style, and I photographed the dishes after I’d served myself a portion. You will notice that my plate gets less and less photogenic as the night wears on- a thousand pardons! This dish might have been my favorite of the night. 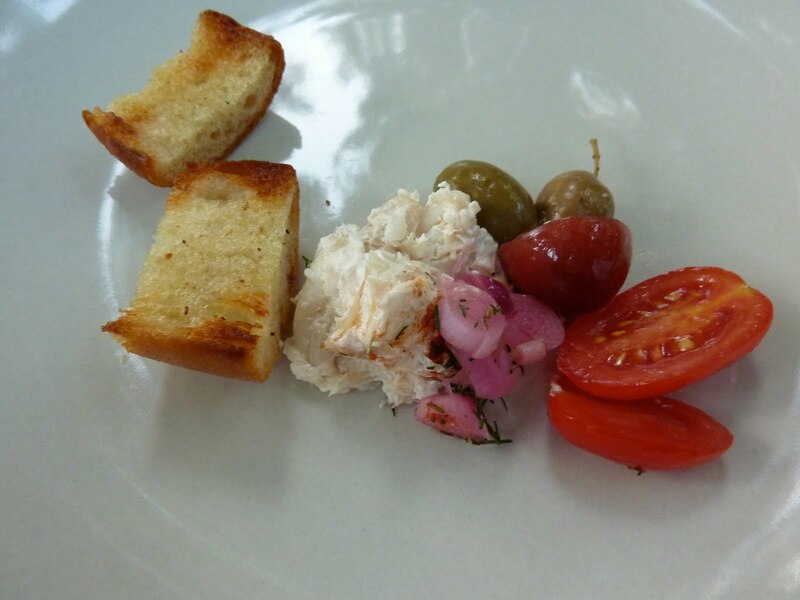 It is: Smoked Triggerfish Terrine with Tomato Salad, Pickled Onions, and Grilled Bread. Um, hells yes. That smoked triggerfish terrine was held together with a delicious cream cheese-like substance, and the tomatoes were those perfect early summer ones we’re so lucky to enjoy in central Texas. 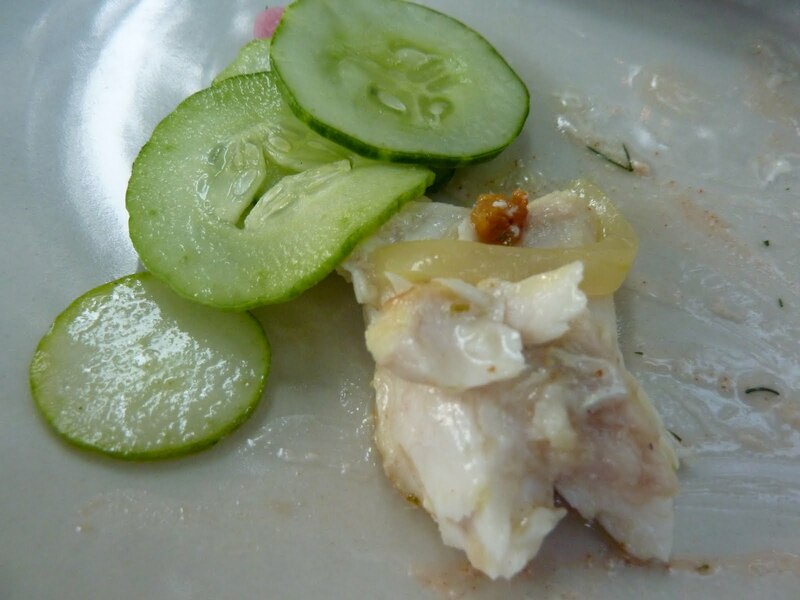 This was a lovely dish (though you might not know it from my picture)- Triggerfish Escabeche with Marinated Cucumbers. In case you were wondering (I hadn’t happened upon this dish before) escabeche is a Spanish term for poached or fried fish which has been covered with a marinade and refrigerated for at least 24 hours. It was lively and refreshing! Also, I thought it was really clever of them to start us off with three cold dishes while the sun was still blazing. Feast your eyes on this! Nice photo, aye? 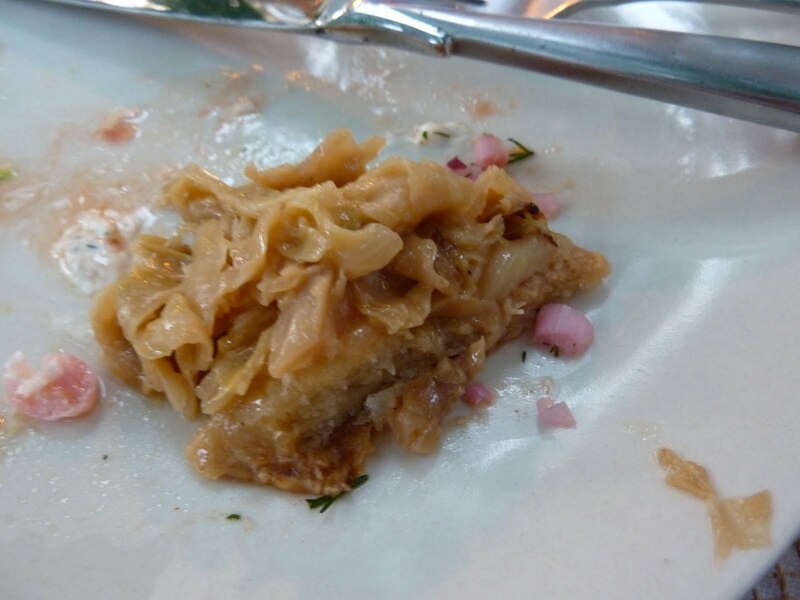 I’m aware this looks disgusting, but I really loved this dish- a Shrimp and Cabbage Tart. I gotta tell you, I have a thing for cabbage that has been smothered in this manner. A few months ago I made a tremendous Smothered Cabbage Risotto that this tart really reminded me of. Yes. Smothered cabbage is the new black. Look at this guy! 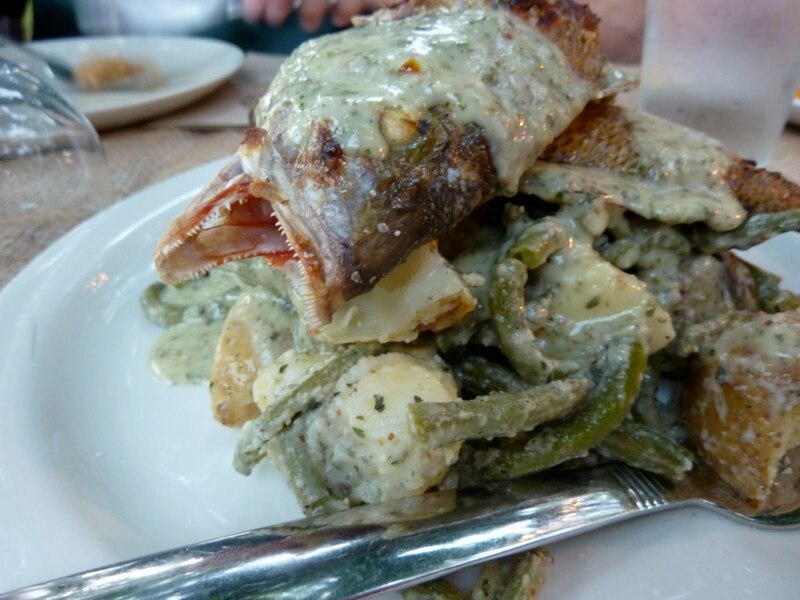 This is Grilled “Mother-in-Law” with Green Bean and Potato Salad and Garlic Vinaigrette. Isn’t that the best fish name ever? One site oh-so-helpfully informed me that this fish is so named because it’s “ugly and has a big mouth”. That seems pretty harsh to me (especially because I enjoyed this particular fish with my very lovely and not-at-all-big-mouthed mother-in-law), but name aside, it was a really delicious fish. More astute readers will notice that the sun went down somewhere between this course and the last one. 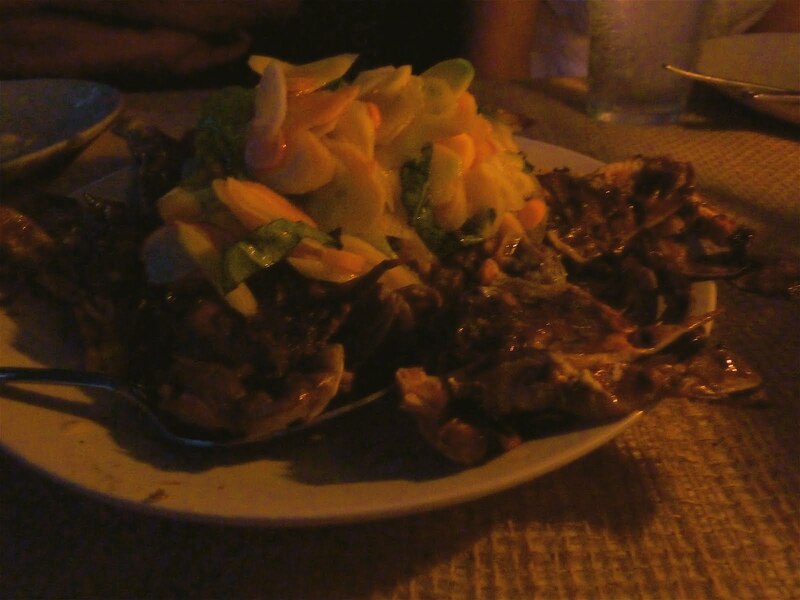 This is a plate of Grilled Softshell Crab with Green Tomato Salad and Roasted Corn. This was super fly and unquestionably the best softshell crab I’ve ever had. Beloved cheese. 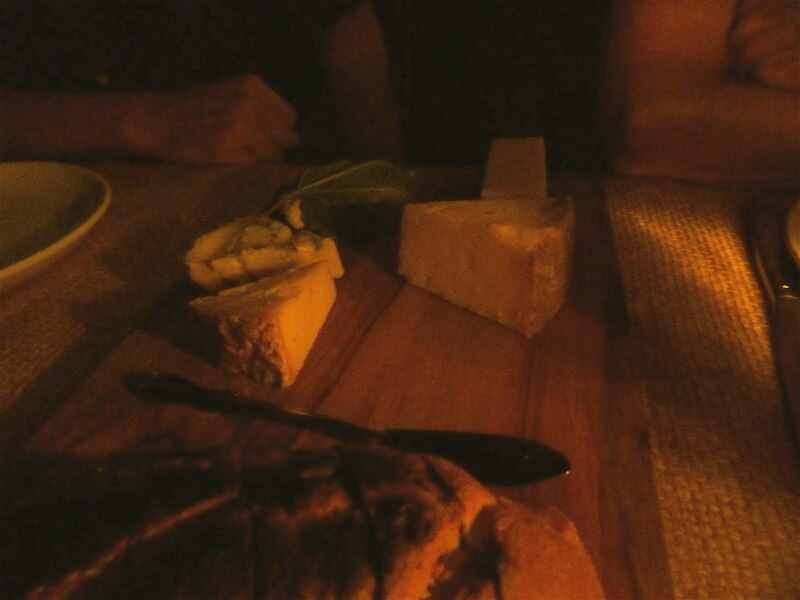 This is an assortment of local cheeses served with homemade bread warmed over the fire. What’s not to love? After this, they served a lovely Plum Sorbet with Poppyseed Cookie, but it was too dark to take a picture. It was a classy end to a really beautiful meal. I liked your “smothered cabbage is the new black” comment. The first photograph reminded me (fondly) of a bunch of scenes from foreign movies where the large Italian/French/Greek family is eating outside on a huge dining table. 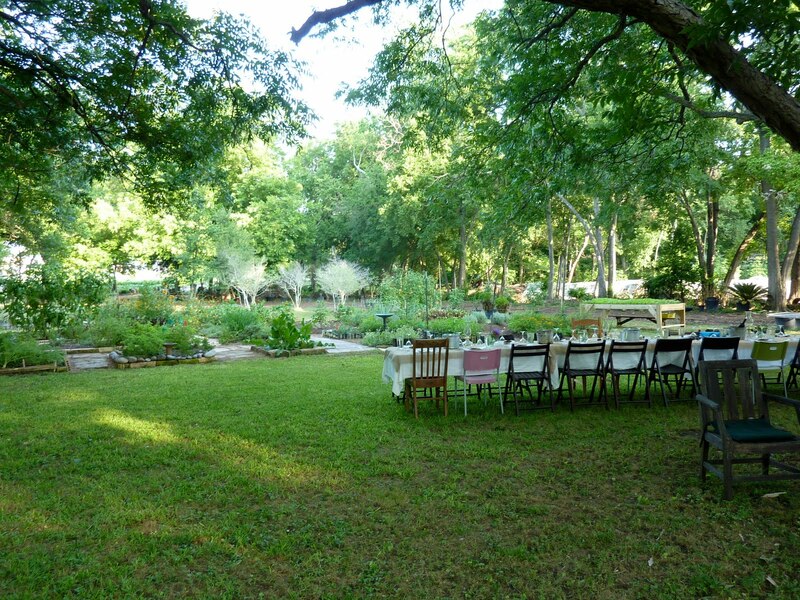 I, too, want to eat out in the yard/field/garden! This feast looks delicious and beyond my comprehension of seafood. Thanks for writing about food!